The Congress and the Janata Dal (Secular) pulled off a major coup in Karnataka by preventing the Bharatiya Janata Party from cobbling up enough numbers to form a government in the state. BJP leader BS Yeddyurappa resigned as Chief Minister on Saturday even before taking the vote of confidence. This was barely 55 hours after he had been sworn in by Governor Vajubhai Vala. This is a huge embarrassment for the party as only a few days back BJP leaders were boasting "We have Amit Shah" on being asked how the BJP would be able to form the government despite not having the numbers. In the end, the party could not get even a single Congress and JD(S) MLA to defect. Even the solitary Bahujan Samaj Party MLA as well as one Independent did not end up joining its ranks. This, despite the buzz that MLAs were being offered as much as Rs 100 crore to switch sides. Here's how the two parties managed to outwit the mighty BJP. The Congress and JD(S) got into the act even before the results were announced. Apparently, the Grand Old Party realised that it wasn't going to win a majority on its own so it began sending feelers to the JD(S) a day before the results. As the results showed that the BJP was clearly emerging as the single largest party, Congress President Rahul Gandhi was quick to offer the Chief Ministership to the JD(S). He deputed senior general secretaries Ashok Gehlot and Ghulam Nabi Azad to the state. Former Congress President Sonia Gandhi too spoke to JD(S) supremo HD Deve Gowda. The JD(S) on its part was quick to respond to the Congress' proposal, instead of negotiating a deal with the BJP. BSP supremo Mayawati, West Bengal Chief Minister Mamata Banerjee and All India Majlis-e-Ittehadul Muslimeen President Asaduddin Owaisi are all said to have spoken to the JD(S) and urged it to align with the Congress to keep the BJP away from power in Karnataka. It must be remembered that the BSP and AIMIM had backed JD(S) during the polls as well. However, Governor Vala had other plans and he invited Yeddyurappa to form the government, giving him 15 days to prove his majority. This could have sealed the deal for the BJP, giving it sufficient time to put pressure on Opposition MLAs. But this was prevented by some extremely proactive and persuasive legal maneuvering by the Congress. The Congress leadership deputed one of the party's key legal brains Abhishek Manu Singhvi, who approached the Supreme Court the night before Yeddyurappa's swearing-in. Eventually, it was the Supreme Court's intervention that came to the Congress-JD(S)'s rescue. The three-member bench gave Yeddyurappa just two days to prove his majority, instead of the 15 days that had been given by Governor Vala. This made it easier for the Congress and JD(S) to hold its flock together. While Singhvi and his team were fighting it out in the Supreme Court, a parallel battle was going on in Bengaluru. Congress MLA from Kanakpura DK Shivakumar took up the task of preventing attempts by the BJP to poach its MLAs. He is said to have been assisted in this task by Hebbal MLA BS Suresh and his brother. Shivakumar also brought Independent MLA Nagesh on the Congress' side. In JD(S), Kumaraswamy personally took up the task of ensuring that none of his MLAs defect to the BJP. Since a majority of MLAs were from the same Vokkaliga dominated belt as Kumaraswamy, they were unlikely to go against him as it would mean a certain defeat in a repoll. The party's moneybags MP Kupendra Reddy also is said to have played an important role. However, Kumaraswamy didn't want to leave anything to chance and prepared to take his MLAs to a “neutral” state. In this process, he was in touch with various non-BJP chief ministers like Pinarayi Vijayan of Kerala, K Chandrashekhar Rao of Telangana and N Chandrababu Naidu of Andhra Pradesh. Interestingly, West Bengal CM Mamata Banerjee is also said to have been advising Kumaraswamy through this process. For the Congress, it proved to be far more difficult to keep the MLAs united. Two MLAs – Anand Singh of Hosapete and Pratapgouda Patil of Maski – went missing, suppposedly under the BJP's pressure. However, this wasn't enough for the BJP. It needed 7 defections or 15 abstentions and all it seemed to have been able to secure was the support of the KPJP MLA and two possible abstentions (Singh and Patil). Yeddyurappa acted swiftly and transferred a few key police officers, hoping to take control of the administration and put more pressure on the Opposition MLAs. But the SC's intervention placed serious restrictions on what Yeddyurappa could do as CM. The court clearly instructed him not to take any major policy decisions. By Friday evening, the numbers still did not favour the BJP. The party's in-charge for Karnataka – Union HRD Minister Prakash Javadekar – is said to have communicated to BJP president Amit Shah that the situation wasn't in the party's favour. The Congress, on Friday evening, began releasing audios of BJP leaders allegedly trying to bribe Congress MLAs to defect. The first audio to be released was that of mining baron Gali Janardana Reddy. By Saturday, the audios kept pouring in with alleged conversations of Yeddyurappa, his son MLA B Sriramulu and even BJP general secretary P Muralidhar Rao, bribing MLAs being made public. This put paid to any possible negotiation with Congress and JD(S) MLAs. Both the battle of perception as well as the numbers were firmly in favour of the Congress-JD(S) combine. The final act of the drama played out on Saturday. The police “rescued” Congress MLA Pratapgouda Patil from Goldfinch Hotel in Bengaluru. The Congress alleged that he was being held hostage by the BJP. The hotel, incidentally belongs to Prakash Shetty, a Mangalore based hotelier known to be close to the BJP. The hotel is a common venue for several BJP meetings and functions. Soon, Patil was seen being escorted to the Assembly by Shivakumar. Anand Singh too resurfaced dramatically and came to the Vidhana Soudha. His wife reportedly could be seen thanking Shivakumar with folded hands, adding to the melodrama. The Kanakapura MLA, who is being hailed as the hero for the Congress-JD(S) alliance, could be seen holding Singh's hand and taking him to his seat in the Congress cluster in the Assembly. The writing was on the wall. Yeddyurappa had lost. Amit Shah, BJP's 'secret weapon', had proven to be a dud. 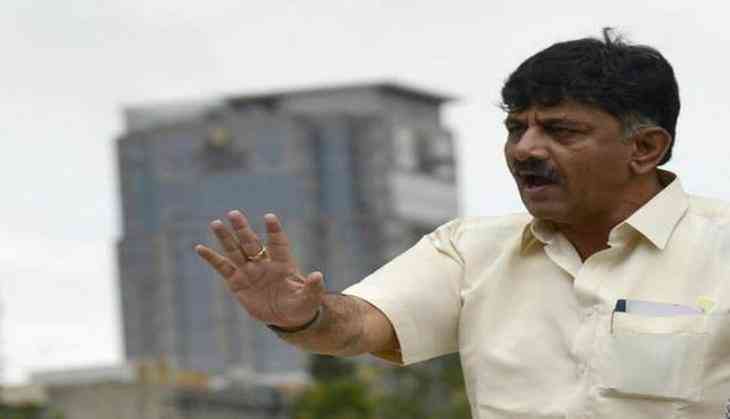 Shivakumar outwitted Shah for the second time, the last time being when he protected 43 MLAs from Gujarat to ensure Ahmed Patel's victory in the Rajya Sabha elections. Irrespective of whether JD(S)-Congress manage to form the government or not, Shivakumar's and Singhvi's stature within the party is only going to risein the days to come.